Departments that handle and house ambulances and other kinds of emergency vehicles need to have the best and safest flooring systems. Liquid Floors understand that these floors need to be durable, professional and safe all at the same time. Liquid Floors also know that these kinds of areas cannot stop daily operation just to upgrade and update their flooring systems. 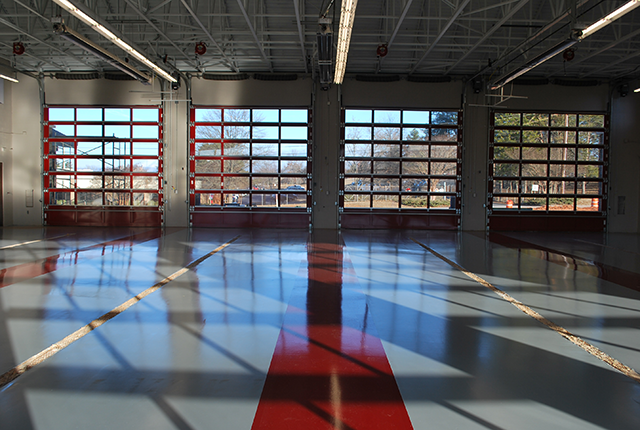 This is why Liquid Floors provide the best quality epoxy flooring and concrete polishing solutions for ambulance and ems facilities throughout the southeast. Our team provides the leading results in epoxy floor coatings and other resinous flooring for ambulance and EMS departments as they need to protect their concrete floors from ongoing foot traffic, abrasions, gurneys, cart traffic, possible impacts, spilled chemicals and so much more. The goal for these kinds of facilities is to be able to safeguard and enhance the safety, health and quality of life of those they are serving. We know how busy these ambulance and EMS workers are, which is why we understand each department needs to have portected flooring that does not require high-maintenance in the form of cost and time. To achieve this goal, the ambulance and EMS staff must be able to maintain their equipment and be on the ready for their next call. Liquid Floors aims to provide the best floor coating results to all ambulance and EMS departments, allowing them to focus on what they do best. So, if you are interested in getting your floors coated with epoxy and urethane, call Liquid Floors at 877-547-8431 now and schedule an appointment or a meeting and we will cater to your needs as soon as possible.